Key Largo Original Lobby Title Card (1948) Bogart Bacall Robinson Film Noir WB. Good condition, some pinholes from display. 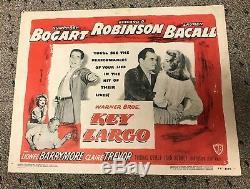 The item "Key Largo Original Lobby Title Card (1948) Bogart Bacall Robinson Film Noir WB" is in sale since Wednesday, January 23, 2019. This item is in the category "Entertainment Memorabilia\Movie Memorabilia\Lobby Cards\Originals-United States\1940-49". The seller is "man_in_black81" and is located in Alexandria, Virginia.